Exactly that, why walk? In our case we did the Wye walk as part of our training for climbing Kilimanjaro. 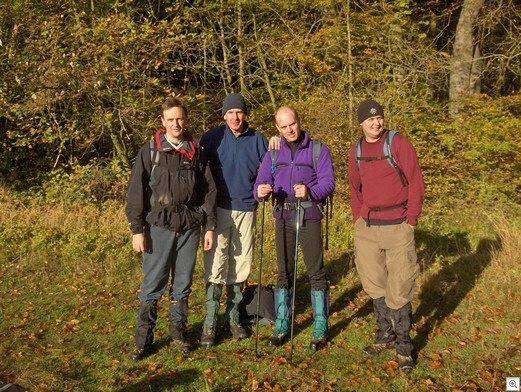 We’re doing walks every Saturday morning until January 2006 when we do the Kili climb. Should be interesting as winter approaches and it starts to get colder. From left to right: Richard Byrom, Pierre Celliers, Alistair Campbell, John Cable – Hilary Griffin was taking the picture. From the small and picturesque village of Wye on the banks of the River Stour our route climbs the flanks of the North Downs, passing through the ancient village of Crundale. From Crundale we follow the Stour Valley Walk past Eggarton Manor and then ascend Blue Downs, from where there are sweeping views across the Stour Valley to the downs on the opposite bank and the medieval village of Chillham. At Blue Downs we leave the Stour Valley Walk and follow paths through lonely Eggringe Wood and Barton Wood, descending to the valley floor before climbing again to Crundale Downs to pass the tiny and isolated church of St Mary’s. From there we follow the path along the ridge of Crundale Downs with views of the downs and countryside all around. There are no roads to be seen, just woods, farmland and pasture. Our route passes through Towns Wood before descending sharply and following a path through Hurst Wood that leads us into a valley and eventually to Combe Manor. From Combe Manor we climb steeply through Colyerhill Wood - where there is a profusion of startlingly white wild garlic flowers in May - to join the North Downs Way along Wye Downs. Here there are truly stupendous views across the weald. 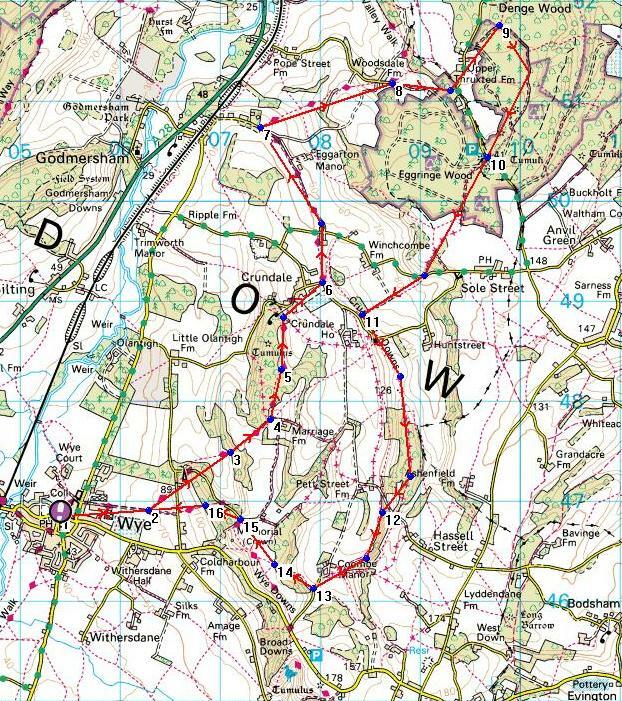 We then follow ancient paths down the slope of the North Downs and back to Wye, where you can have lunch, tea or a drink at one of several renowned pubs and tea shops. The picture below shows the actual versus planned route as plotted on the Magellan Mapsend software. I had to leave half way through the walk and ended up getting a bit lost on the way back as I tried to take some shortcuts that didn’t work out. Eventually I used the main road to Wye to get back to out starting point as cutting across fields just wasn’t working. In total I ended up walking 12 miles which took about 6 hours. The next picture shows the planned route for the Wye walk route using the Memory Map software. My friend Pierre has bought this software and it’s interesting to compare this with the Magellan Mapsend maps that I bought for the purpose of uploading detailed maps to my GPS. Memory Map provides you with quite a nice three dimensional fly through of your route. 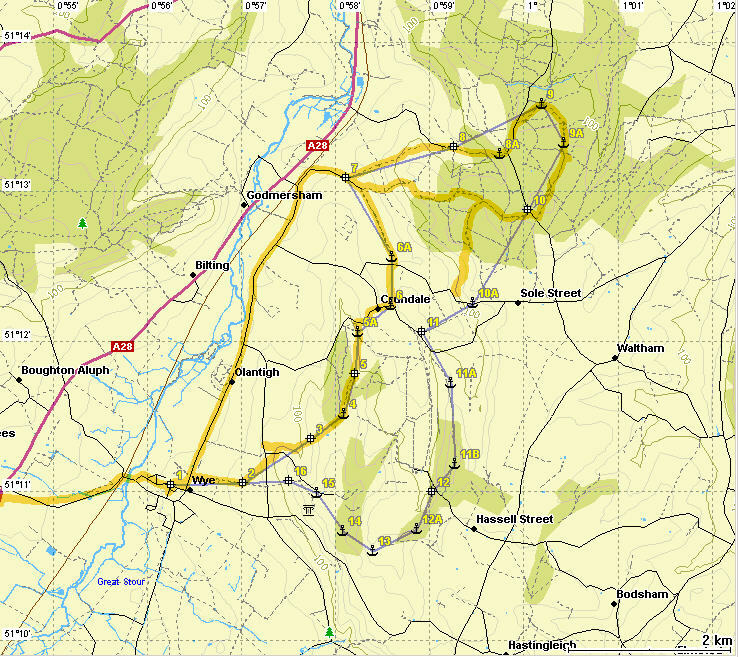 More pics of the walk are here and I’ve also uploaded a Google Earth KML showing the route, waypoints and trackpoints. Walking poles - when walking uphill try and keep the walking poles closer to your side rather than wasting energy extending your arms far out in front of you. To find out more about how to use walking poles effectively check out these links. Walking rate – calculate an expected walking rate so that you can ascertain how long it’s going to take you to complete a walk. GPS - always ensure your GPS is fully charged and that you have spare batteries, make sure you have a map as an alternative.